Those that know me well know that I. LOVE. FOOD. When I was a kid, I was never a picky eater. My parents often grew a small garden, and I always loved fresh vegetables. We even had a granny smith apple tree in our yard in Northern California, which yielded sooooo many apple pies, I can’t even begin to tell you. And we had miniature plums, too. When I became an adult and began cooking for myself, I started off the way many young adults do… whatever is decent and cheap will work. Fast food? Of course! Somewhere along the way The Food Network television channel became popular, and my love of REAL food was re-ignited. Fast forward a decade or so, and I stumbled across a food reset concept called the Whole 30. I won’t bore you with the details because you can find them at www.whole30.com, but the concept is that you eat only quality proteins, vegetables, and moderate amounts of fruit fo r 30 days. I wanted to see how my body reacted to certain food groups such as legumes, dairy, grains, etc. I launched headlong into researching this food reset and learned A LOT about food and general health. Again, if you know me well, you know that I will research the heck out of something that I find interesting. 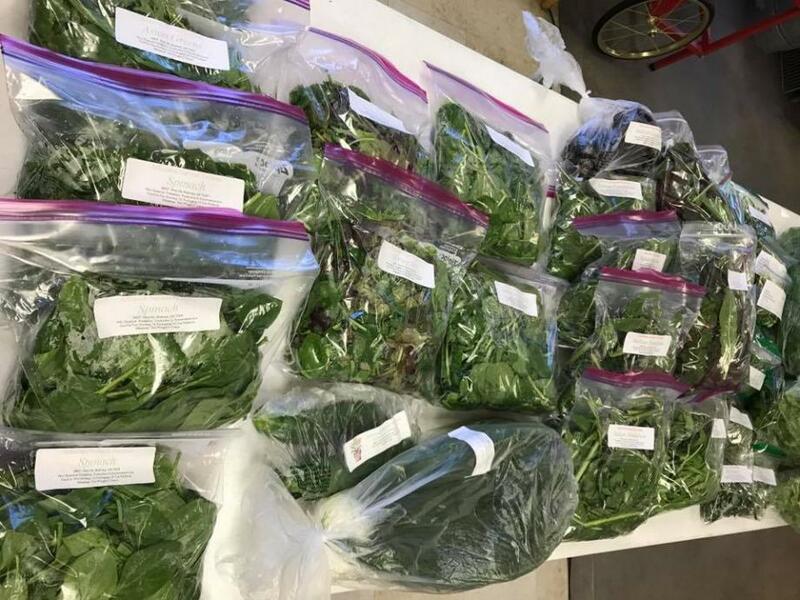 In my research, I learned about organic food versus naturally grown, the Dirty Dozen and the Clean Fifteen (lists of the worst and best fruits and vegetables to buy based on pesticide residue), and best of all, Arkansas Local Food Network (ALFN). The ALFN online market was, for me, the best of both worlds. It was a farmer’s market that I could access without having to get up at the crack of dawn on a Saturday to get food before they run out. Instead, I could select my food and place my order online from Sunday to Wednesday each week and pick up my food Saturday morning at a civilized hour. It was literally like a Kroger Click List or Wal Mart Grocery Pickup before those concepts existed. I grew to really enjoy season vegetables and fruits, rather than the bland likenesses you find in the grocery store in off-season months. Grass-fed beef raised within 50 miles of my home really does taste better than basic ground beef that you buy at your nearby Kroger or Wal Mart. In the four years or so that I have been an ALFN member, the market has matured quite a bit. More farmers have been added, and several of the producers aren’t growers, but food preparation artists. 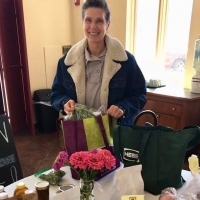 They bake delicious treats, they can vegetables and make jams and preserves, they prepare rice mixes or fruit cobbler “kits.” There is a little something for everyone! 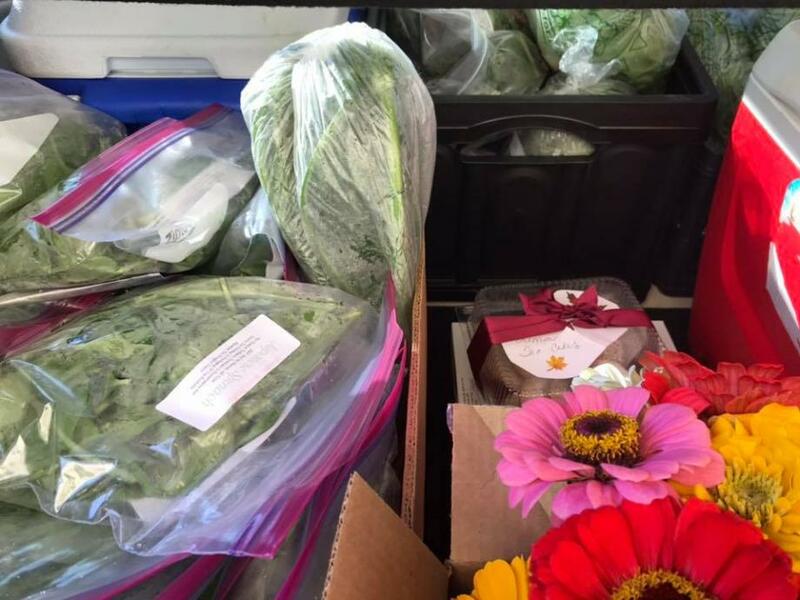 For those who are wondering what ALFN is, I will use a quote from Missy Tinnermon, “This is not your mama’s co-op!” ALFN is not a typical CSA program in which you pay a fixed fee and receive a basket or box of whatever is available. It is an actual online market with pictures of the produce or goods for sale, the quantity, and the price. You locate a yummy item like broccoli from Barnhill Orchards in Lonoke, or ground pork from Ottens Hill Farm in Sheridan, add it to your cart, and place your order. It’s as easy as ordering from Amazon or E-Bay, but probably more fulfilling. In return, you are supporting local farmers, many of whom earn their primary income from farming. Unlike some CSAs, you only pay when you order. 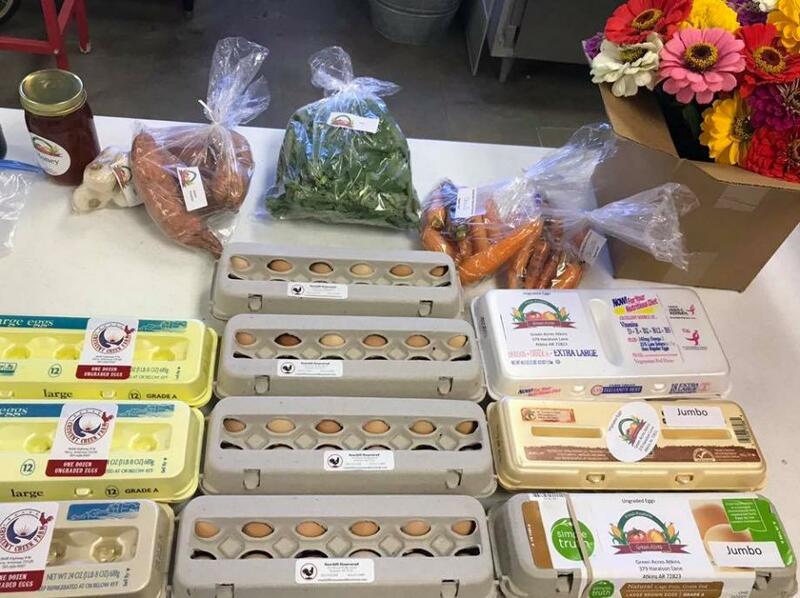 If you are all stocked up on eggs and veggies, you don’t have to order, and you don’t owe any money. Have I mentioned how delicious the food is? Because it is often harvested within a day or two of being delivered to the customer, the food is more nutritious and more flavorful. Many of the producers use natural, chemical-free methods of growing plants and raising animals. While they aren’t all certifiedorganic (which is an expensive process to achieve and maintain), many are certified natural or are chemical-free as a practice. 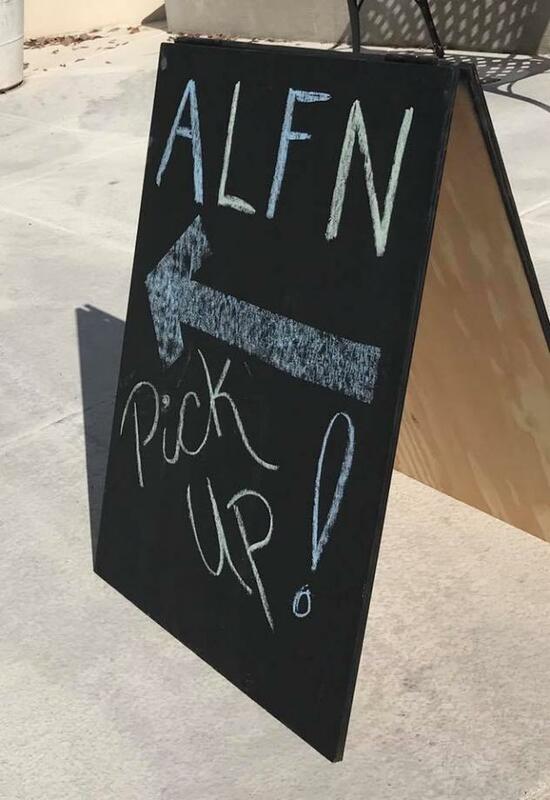 How did ALFN make its way to St. Margaret’s? As I was ordering and picking up my food each week, I wondered how many people in West Little Rock utilized the market. 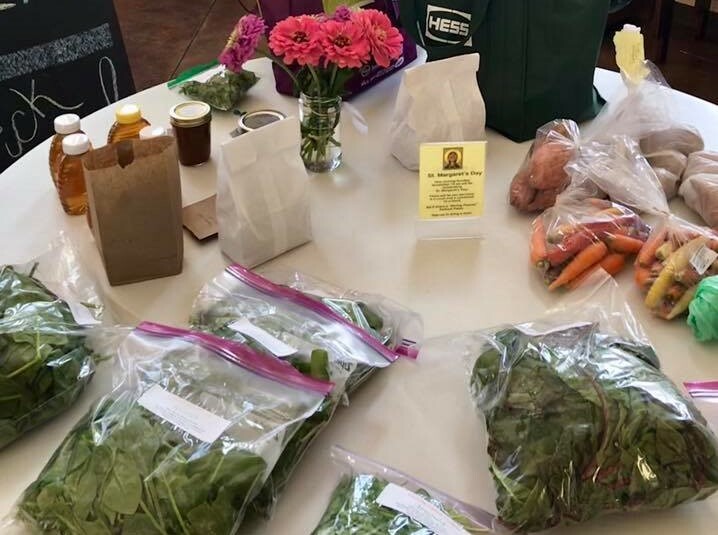 I mentioned the idea of a pickup at St. Margaret’s in West Little Rock to Claire, the market manager, and she discussed it with the ALFN board. They were very excited to see some expansion! We conducted an online survey and found significant interest in ALFN in West Little Rock… so here we are! If you have set up an account but haven’t ordered yet, please give it a try! If you haven’t set up an account so you can look around at the products and prices, please take a few minutes to set that up. I think you’ll be glad you did.